Brian Altman had the button, but Lou Giampa acted out of turn by declaring all in. Brian elected to limp, and it was ruled that Lou's all in would stand. Brian made the call. Lou had two live cards, but he failed to hit on the [4h][6s][5s][2c][2s] board, keeping Brian's king high in front. Lou will be eliminated in 2nd place, good for $54,109. 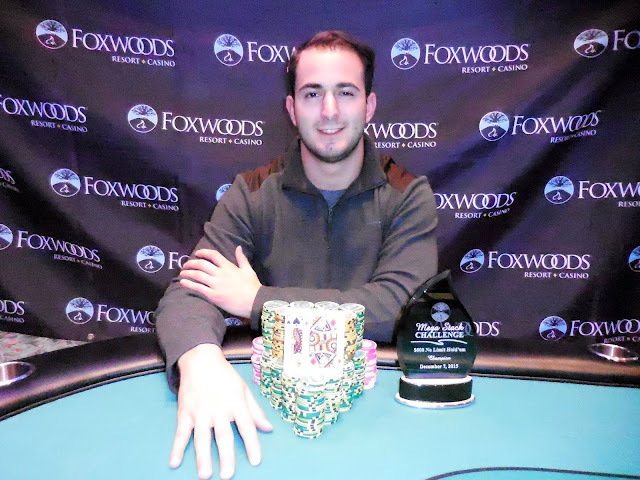 Brian Altman is the winner of Event #1 $600 NLH, taking home $84,208, the title, and the trophy. Congratulations, Brian! 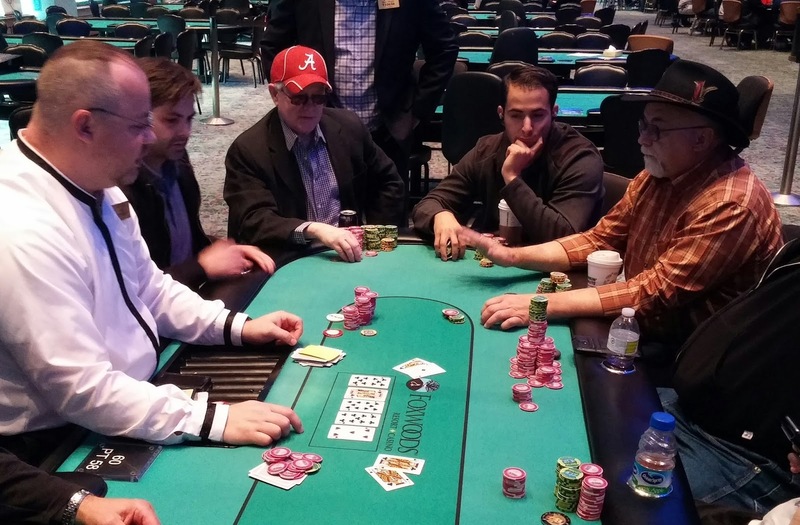 Ben Nakhoul was all in preflop holding [As][2d] and was up against Brian Altman's [Js][Jc]. Ben didn't hit his ace, but he was still live on the [8s][5d][5c]. Unfortunately, Brian continued to run hot as the [Jd] hit the turn to give him an unbeatable full house. 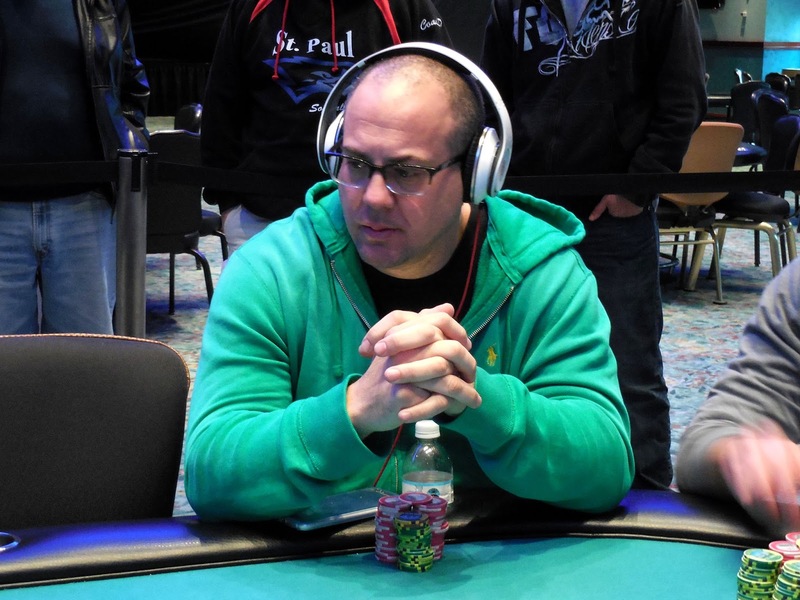 The [4s] river fell, and Ben will be eliminated in 3rd place, good for $38,368. Brian Altman opened the pot and snap called after Don Fisher moved all in. Don was caught with his [Kh][8h] but had two live cards against Brian's [As][Jh]. The [Ac][Qh][7c] flop left Don drawing thin, and the [5s] turn sealed his fate. When the meaningless [Ah] hit the river, Don hit the payout desk to collect his $27,054 for his 4th place finish. 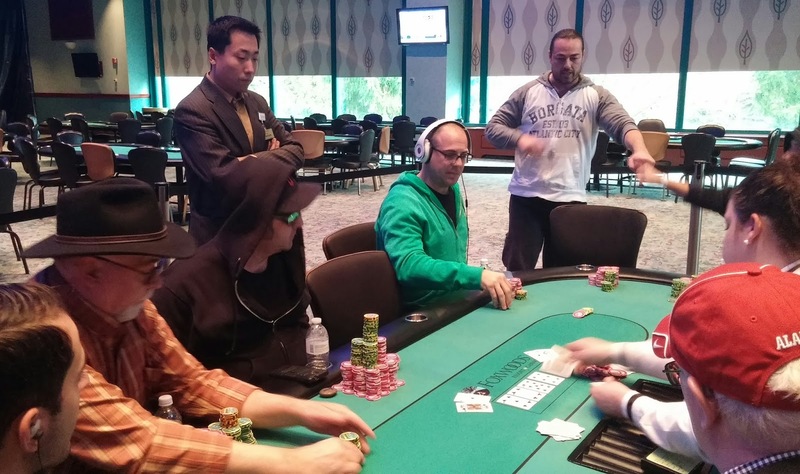 Lou Giampa was all in preflop for 1,700,000 holding [As][Jc] and would need some help as he ran into Ben Nakhoul's [Ad][Qc]. He got the help he needed on the [Ac][Jh][6s] flop, and the [2d] turn and [9c] river kept Lou's two pair in front, doubling him up. Ben Nakhoul was all in preflop for 1,320,000 holding [As][6h] and was up against the [Qd][Qc] of Brian Altman. 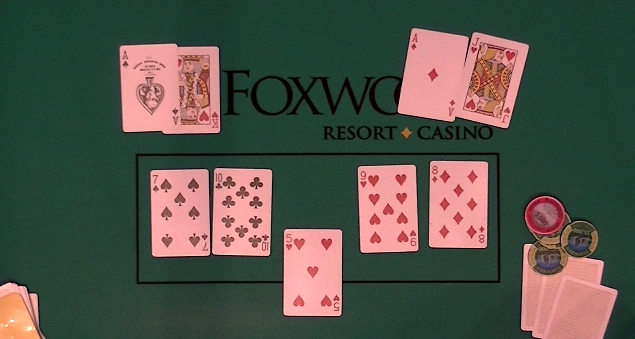 Ben asked the dealer for an ace on the flop, and the dealer obliged with the [2h][Kh][Ah] flop. Brian had just one out to knock out Ben, but the [3c] turn and [Jh] river wasn't it. Ben will double up to stay alive, while Brian still has a healthy 9,000,000 in chips. 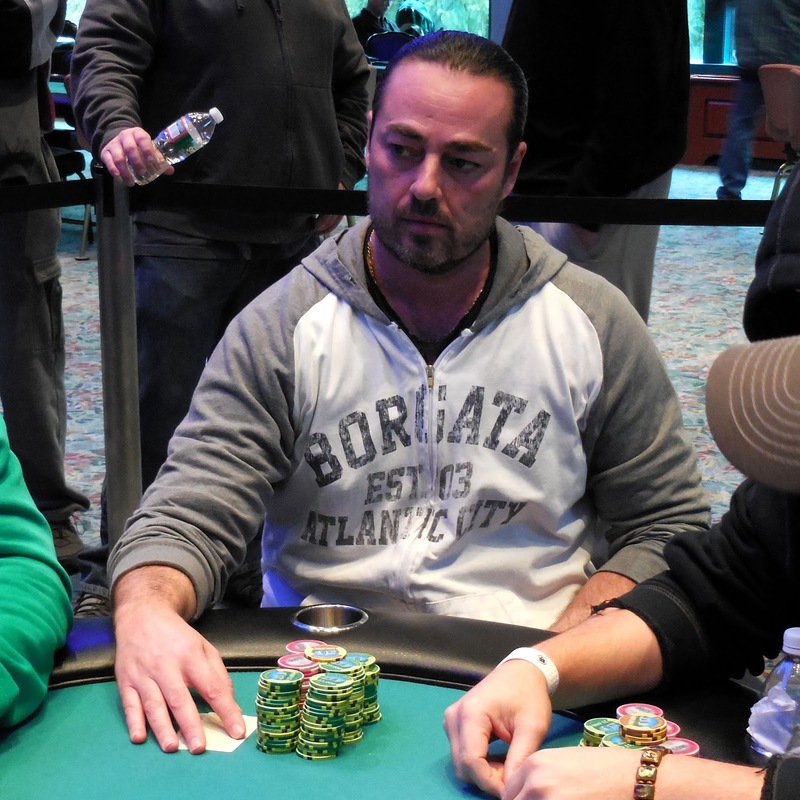 John Gilmartin was all in preflop holding [Ac][9d] and was up against Brian Altman's [Ah][6s]. The [8s][2d][Qs] flop changed nothing, but the [8h] on the turn meant that the two would chop half of the time. The [9c] was a good river card for John, as his hand held up for a full double. A few hands later, John was all in again against Brian, this time with [Ts][Tc] against Brian's [Ah][Ks]. John's tens were good on the [4d][6d][4s] flop, and the [7c] turn changed nothing. But the [Kd] spiked on the river to give Brian the winning pair. 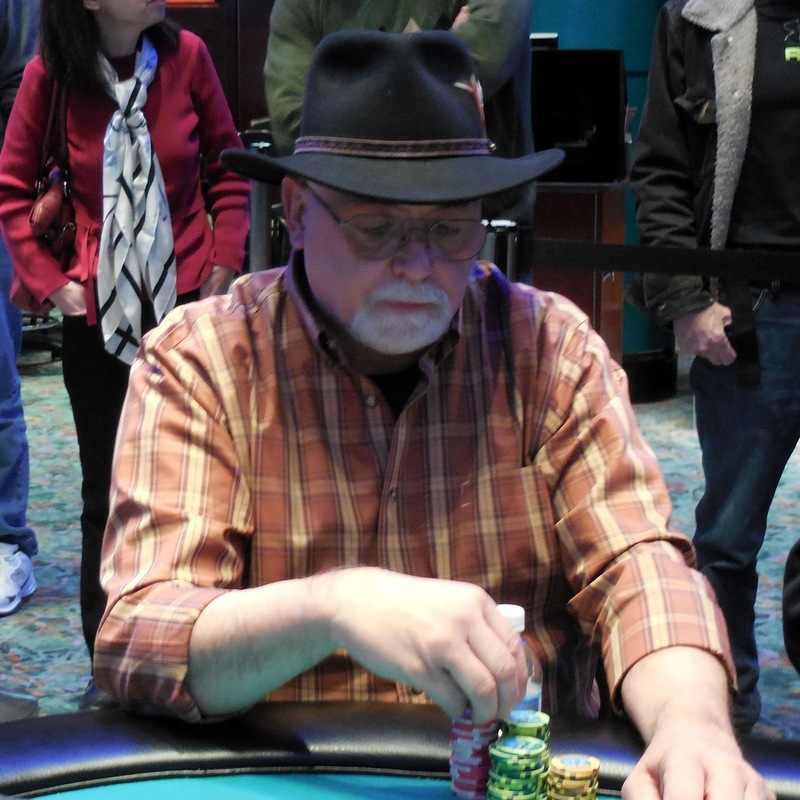 John will exit this tournament in 5th place, good for $20,906. Lou Giampa was all in for 1,630,000 holding [Ad][Jh] and was up against John Gilmartin's [As][Kh]. 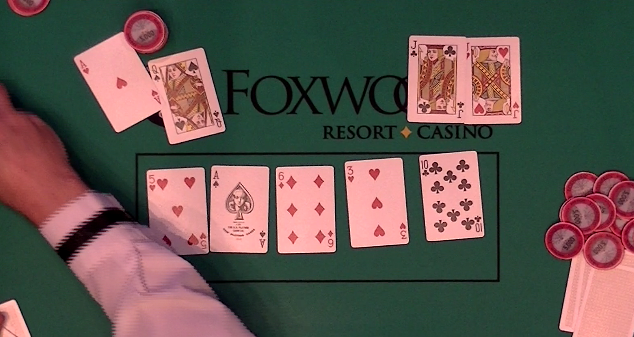 The [7s][Tc][5h] flop was no help for Lou, but the [9h] turn gave him a gutshot to go with his live jack. The [8d] river was just what he was looking for, sending more than half of John's stack over to Lou. 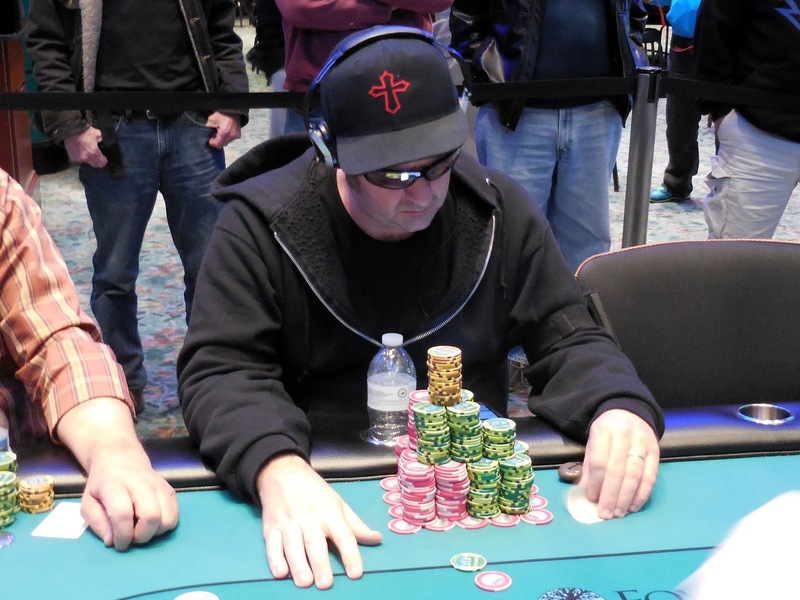 David Carleton was all in preflop holding [Kc][Qh] and was up against the [Ad][Qd] of Brian Altman. The [9d][Jh][9s][Ac][Jc] board didn't improve David's hand, and he will exit the tournament in 6th place. He will collect $16,970 for his efforts. 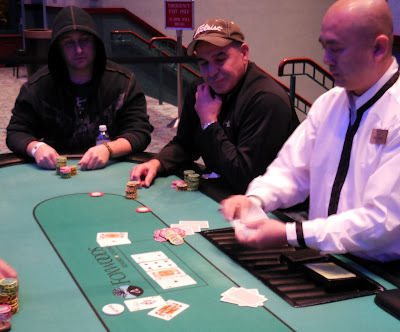 Vic Amereno was all in preflop holding [As][Kh] and was up against the [Js][Jd] of Brian Altman. The [Qh][Th][Qs] flop was no help to Vic, nor was the [2h] turn or [2c] river. Brian's two pair will win the pot, sending Vic to the rail in 7th place. He will collect $13,773 for his efforts. Don Fisher has taken over a commanding chip lead. He now sits on around 6,150,000, which is so many physical chips that tournament staff are standing by to color some of those chips up. With 7 players remaining, Don has approximately a third of the chips in play. 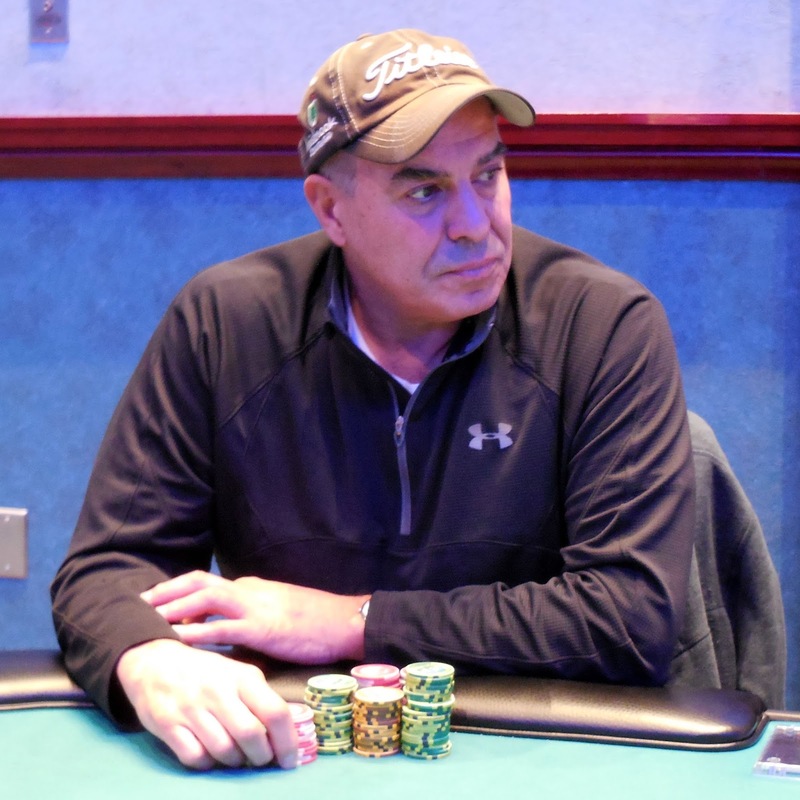 At 30,000/60,000 blinds, Raymond Moseman moved all in for around 3,000,000 and Don Fisher moved all in over the top for just a bit more. This time Don held [As][Ac] against Raymond's [6h][6c]. The [Ac][7h][9c][4h][Qc] board gave Don the winning hand, and once the stacks were counted down to confirm, Raymond was declared our 8th place finisher. He will collect $10,822 for his efforts today. 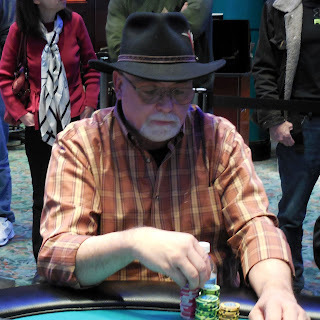 David Carleton opened the pot and action folded to John Gilmartin in the big blind who moved all in. David snap called and tabled his [As][Ac], which coolered John's A-K. 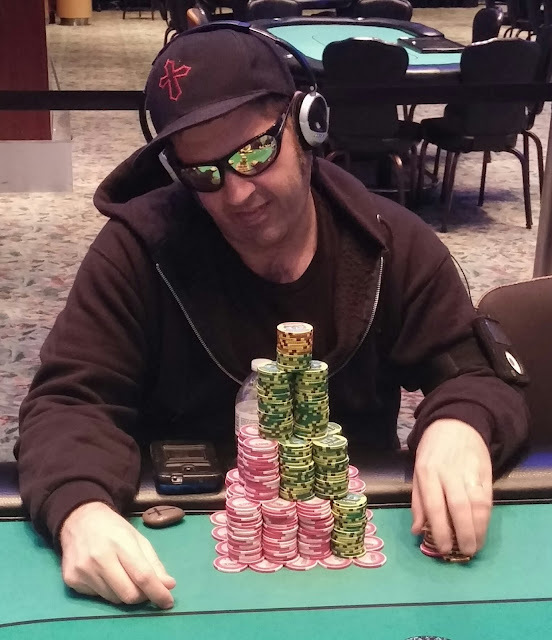 The [5s][4c][9h][6d][Kd] kept David's aces in front, unlike last night when aces chopped with A-K. David will double up to 2,800,000 while John will be knocked down to 2,250,000. 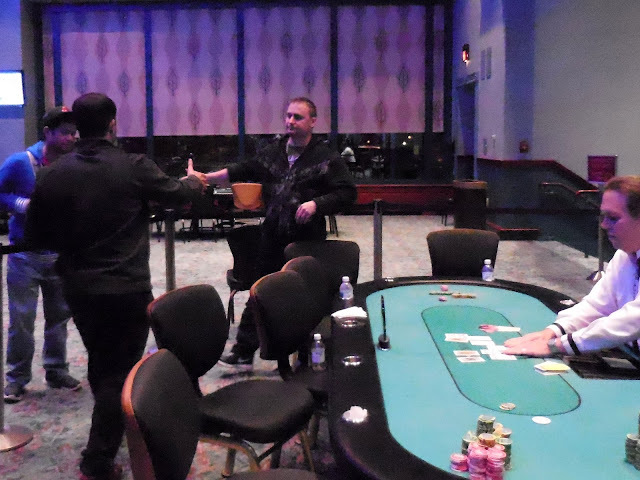 Luis Vazquez was all in preflop holding [Kh][Jd] and was called by Don Fisher holding [Ad][Kd]. 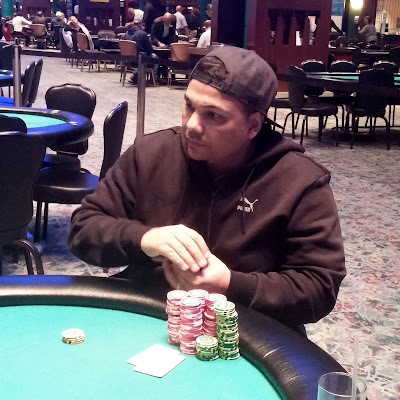 Luis would need to get lucky, but the [Qs][Qc][Kc] left him drawing thin to a chop. The [2s] turn changed nothing, and the [5c] river meant Luis would be our 9th place finisher. He will collect $8,166 for his efforts. Don Fisher was all in preflop and Vic Amereno made the call. It was another flip as Don held [Ah][Qs] to Vic's [Jh][Jc]. The [5h][As][6d] flop put Don in front, and no jack came on the [3h] turn or [Tc] river. Don's stack was counted down to 855,000, and after paying off the allin, Vic was down to 255,000. Vic moved his chips in the very next hand and Don called him from the small blind. Vic had the best hand again with K-6 to Don's T-9, and the king high held up to double Vic up to just under 600,000. 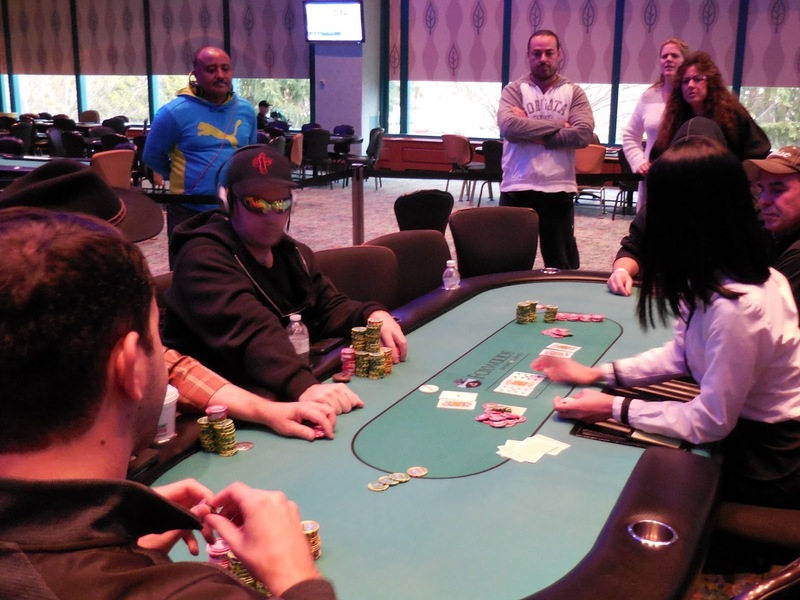 James Lex was all in preflop and John Gilmartin made the call. James was flipping for his tournament life with [Ad][Qc] against John's [Js][Jc]. The board ran out [Tc][Kh][Ts][9c][5h] to keep the jacks in front, and James will be eliminated in 10th place. He will earn $6,198 for his efforts. 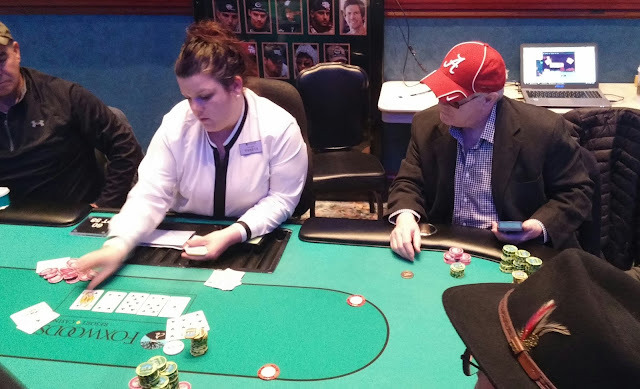 On one of the first hands of Day 3, Frankie Flowers called Raymond Moseman's all in with ace jack. Raymond held [4h][4d] and hit a set on the [4c][Qh][Th] flop. Frankie did hold a gutshot, but Raymond made a full house on the [Td] turn, leaving Frankie drawing dead. The meaningless [7s] hit the river, and Frankie will be eliminated in 11th place. He will collect $6,198 for his efforts. Registration will remain open until the start of level 7 (approximately 1:45pm). There is a 45 minute dinner break after Level 14 (approximately 5:35pm). Full structure is available h`ere. Day 3 levels will be 60 minutes. Play has ended for Day 2 of Event #1 $600 NLH. The final 11 players will return tomorrow at 12pm EST to play down to a winner. Chip counts and seating assignments will be posted shortly.